Thankfully for us backpackers, a backpacking sleeping bag is not the bulky, heavy traditional bag that usually comes to mind. In fact, they’re quite different. Made to provide warmth and comfort, while at the same time being compact and light, this piece of equipment is an important part of your gear. Even though these sleeping bags are made to be lighter than their traditional counterparts, your sleeping bag will still probably be one of your heaviest items of gear. Depending on the type of sleeping bag you get, they can weigh as much as 4-5 pounds. However, your typical 3 season sleeping bag will normally weigh in around 2-3 pounds. If you’re interested in a sleeping bag on the lighter end, visit our page on ultralight sleeping bags. As you look for a backpacking sleeping bag, we’ll focus on a couple of important things to consider: the comfort rating and the fill. The comfort or temperature rating indicates the most extreme temperature the sleeping bag is meant to perform at. For example, if you see a sleeping bag that says “+20” in its description, that means the sleeping bag is able to keep most people comfortable as long as the air temperature gets no lower than 20 degrees F.
This rating is an approximation and depends on a few factors such as if you’re in a tent or not, if you are a “cold” or “warm” sleeper, if you have food in your belly, the clothing you’re wearing while in the bag, etc. When picking a sleeping bag, choose on the colder end of what you expect to experience. For example, if you’re expecting the temperature to stay above freezing, a +35 bag would probably work, but it’s smarter to bring a +20 bag in case of an extra chilly night. If you’re concerned about being too warm, remember you can always vent your bag. Next, look at the type of fill you want. The fill is what insulates your bag. The type of fill you have is also a determining factor in weight, compressibility and durability. Backpacking sleeping bags come with either down or synthetic fill. Both have their pros and cons. In order to decide what’s best for you, let’s take a close look at these options. Down is the soft, fluffy under feathers of birds like geese and ducks. It does a superior job at insulating, while weighing very little. It is able to compact very well and if properly cared for can perform well for years and years. On the downside, down loses all ability to insulate if it becomes wet and cannot insulate until it dries again, which takes a long time. However, if you are careful and don’t experience frequent extreme weather, your sleeping bag should not be exposed to that much water. Down is also more expensive, but this cost evens out in the long-run due to its lifetime. Also, some people are allergic to down. Synthetic fill is made of long, thin plastic fibers. A big advantage to synthetic fill is that it is less expensive. It also provides some insulation when wet and dries quickly. Some of the cons of synthetic is that is it heavier relative to the warmth it provides. Synthetic is also bulkier and does not compact as well as down. The fibers do degrade over time, reducing the effectiveness of your sleeping bag. How do you choose between the two? Well, for beginner backpackers, people who don’t want to spend lots of money and those who expect to be in the rain a lot, synthetic is probably the best choice. 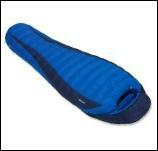 If you’re really needing or wanting the lightest, most compact or warmest backpacking sleeping bag, go with down.